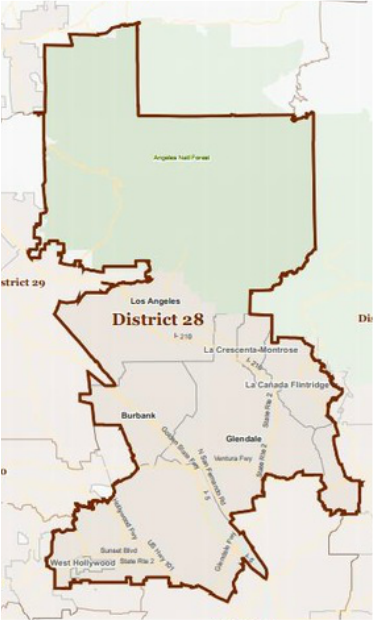 Democrat Adam Schiff currently represents Congressional District 28. Schiff is expected to easily win re-election in 2016. Congressman Adam B. Schiff represents California's 28th Congressional District, which includes all or parts of the communities of Angelino Heights, Atwater Village, Burbank, East Hollywood, Echo Park, Elysian Valley, Franklin Hills, Glendale, Griffith Park, Hollywood, Hollywood Hills, La Cañada Flintridge, La Crescenta, Los Feliz, Montrose, Mount Olympus, Pasadena, Shadow Hills, Silver Lake, Sunland, Tujunga, Verdugo City and West Hollywood. Throughout his tenure in Congress, Schiff has focused on improving our economy, bolstering national security, strengthening our communities, helping small businesses and improving education, safety and health care for our children. In his 7th term in the House of Representatives, Schiff currently serves on the powerful House Appropriations Committee and the House Permanent Select Committee on Intelligence. As one of the oldest and most powerful committees in Washington, the House Appropriations Committee is responsible for setting all funding priorities for the federal government. Schiff currently sits on the Commerce, Justice, Science, and Related Agencies Subcommittee and the State, Foreign Operations, and Related Programs Subcommittee. The House Permanent Select Committee on Intelligence oversees the nation’s intelligence agencies including components of the Departments of Defense, Homeland Security, Justice, State and Energy. A senior Member on the House Intelligence Committee, Schiff is the Ranking Member of the Subcommittee on Technical and Tactical (T & T) Intelligence, which oversees the technical aspects of intelligence gathering, including space-based assets, as well as cyber security. T & T also has primary oversight over the National Security Agency, the National Reconnaissance Office, the National Geospatial Agency and other military intelligence programs. In addition to his committee work, Schiff’s top priority is to create jobs. Schiff has always believed that small businesses have been the true engine of growth in challenging economic times and has been fighting to enact tax deductions for small businesses that can be used for start-up expenses, to eliminate payroll taxes for new hires, and to remove burdensome regulations. Schiff also believes that reestablishing America as a manufacturing powerhouse is crucial. Through these efforts, small businesses can begin growing and adding jobs again so that all Americans can enjoy a brighter, more prosperous future. Schiff has also been a leader on national security efforts and has pushed for a broader strategy that emphasizes diplomacy, intelligence reform, and efforts to stabilize countries that are at risk of becoming future failed states and havens for terrorists. He has advanced efforts to ensure the safety of all Americans by improving nuclear safety, and is the author of the Nuclear Forensics and Attribution Act, which President Obama signed into law on February 16, 2010. In March 2003, Schiff co-founded the Democratic Study Group on National Security in an effort to explore emerging national security issues with other Members of Congress. The group has hosted a wide range of speakers on topics such as international terrorism, postwar planning, defense, military transformation, shifting alliances, Afghanistan, Iraq, homeland security, non-proliferation, Iran, Korea, the United Nations, and missile defense. Schiff also co-founded the Congressional Caucus for Freedom of the Press in May 2006, a bipartisan, bicameral caucus that is chaired by Schiff. The Freedom of the Press Caucus aims to advance press freedom around the world by creating a forum to combat and condemn media censorship and the persecution of journalists around the world. Schiff is also the author of the Daniel Pearl Freedom of the Press Act, signed into law by President Obama on May 17, 2010. A long time champion of the environment and mass transit, Schiff is the author of the Rim of the Valley Corridor Study Act, which was signed into law by President Bush on May 08, 2008. As a State Senator, he wrote the legislation establishing the Gold Line Light Rail Authority and in Congress has led efforts to extend the light rail throughout the San Gabriel Valley. As a former federal prosecutor, Schiff has made improving public safety, with an emphasis on smart, cost effective solutions, a major focus of his work in Congress. Among his successes are obtaining federal funding to create a Foothills Regional DNA Lab in Glendale to serve the crime laboratory needs of Glendale, Burbank, Pasadena, and other foothill cities. The lab began operations in April 2012. He also was able to obtain vital funding to assist the Los Angeles Police Department and Los Angeles Sheriff’s Department with eliminating a backlog of thousands of untested sexual assault evidence kits, resulting in numerous convictions in cases that would otherwise have gone unsolved. Legislatively, he introduced the Katie Sepich Enhanced DNA Act of 2012 which encourages states to collect DNA upon arrest for certain felonies in order to solve open cases and prevent further crimes. Schiff’s bill passed Congress on December 30th, 2012. Because the Entertainment Industry is one of the largest job creators in the region and an economic powerhouse, Schiff is a leader on efforts to combat intellectual property theft and piracy. He is a founder and co-chair of the Congressional International Anti-Piracy Caucus, a bipartisan group of House and Senate lawmakers dedicated to working with America’s international trade partners to secure the enactment of strong copyright laws and the vigilant enforcement of those laws. Schiff is a strong proponent of science and believes that American leadership in space exploration is a keydriver of American leadership in a host of high-tech and emerging industries. As a member of the Appropriationssubcommittee that funds NASA, Schiff has fought hard to preserve and expand the robotic missions undertaken by the Jet Propulsion Laboratory right here in La Cañada Flintridge. Born on June 22, 1960, Adam is a graduate of Stanford University and Harvard Law School. He and his wife Eve (yes, it's true) have two children, a daughter, Alexa Marion, born in July 1998, and a son, Elijah Harris, born in July 2002.